In the late third century AD the Roman Empire was showing signs of its coming collapse. The political framework was becoming corrupt and decadent and two Germanic tribes, the Franks and the Alemanni, periodically invaded across the Pyrenees causing significant destruction. In 410 AD, the Suevi and the Vandals, other Germanic tribes, were forced into the Iberian Peninsula because the Huns were displacing them in Europe. These were followed by the Visigoths, from Gaul, one time enemies of Rome who then became their allies. The Visigoth era in Spanish history is one that tends to be forgotten now, overshadowed by the Roman rule which preceded it and the Moorish period which followed. It does, however, have one or two things of interest to contemporary minds. Having founded the Visigoth kingdom of Toulouse in the south of modern France the long-haired Visigoths gradually expanded their influence into Iberia eventually setting up their capital in Toledo during the reign of Leovigild. Although the Visigoths were very different people to the Romans, they left behind a legacy of very decorative, often gaudy, jewellery but their language had a negligible influence on the natives because they didn’t mingle with them much. They tended to keep the same Roman institutions and legal code and traded with Mediterranean countries to keep contacts close. Their most obvious effect was the depopulation of cities as people moved to the countryside where a kind of feudal system was in place. In 587AD, Reccared, the Visigothic king in Toledo, converted to Catholicism from the Arian Christianity he had previously worshipped and this led to a movement to unify the various religions that existed in the land at the time. The Council of Lerida in 546AD had tried to bring the churches more under the influence of Rome but there were still regular revolts from members of the nobility and rogue bishops. There is not much left of Visigothic architecture in Spain but what remains is interesting. For example, what is probably Spain’s oldest church is the 7th century San Juan, which can be found in Baños de Cerrato in the province of Palencia. In Visigoth times this was an important grain producing region and the King Reccesuinth commissioned the building of a church there when, on returning from a successful battle with rebelling Basques, he drank from the waters and recovered from all his ailments. You can still see the original inscription in the stones above the entrance. Several bronze belt buckles and liturgical objects as well as a necropolis with 58 tombs have been discovered here. The impressive Gothic Cathedral at Palencia itself also has a crypt from the Visigoth era. 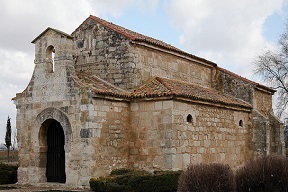 At Quintanilla de Las Viñas, 22 miles south east of Burgos, there is the Ermita de Santa María de Lara which is a lovely legacy of the Visigothic architectural style, it has an unusual triple frieze of bas reliefs on its outer walls, and there are others still to be found in La Rioja and Orense regions. You’ll see early examples of the horseshoe arch, which was to become so predominant in Moorish architecture, in all these Visigoth structures. The fascinating city of Toledo, it’s like a walk around a museum covering every historical period, still has some Visigothic influences to be seen. Toledo, though, was itself the scene of so many feuds between rival Visigoth nobles and clergy that when the Muslims crossed the Straits of Gibraltar in 711 they didn’t encounter many problems in defeating the city on their march through Spain.